When cruising from Puerto Rico to Fort Lauderdale, you can travel through the Exumas up towards the Providence channel or stay south through the old Bahama channel. I will outline here the old Bahama route. It is a wonderful, 1,000 nm journey with the predominant southeast tradewinds and swell. It is an American trip as you never leave the jurisdiction of the United States. I completed this route a month ago non-stop on delivery of a 44-foot yacht. As we arrived in the Port Everglades basin where, sure enough, US Customs and Border Control pulled us over. They asked, “Where are ye out of, boys? What was yer last port of entry?” The response seemed to shock them. “Fajardo, Puerto Rico.” In terms of our legal travel obligations we might just as well said Georgia. 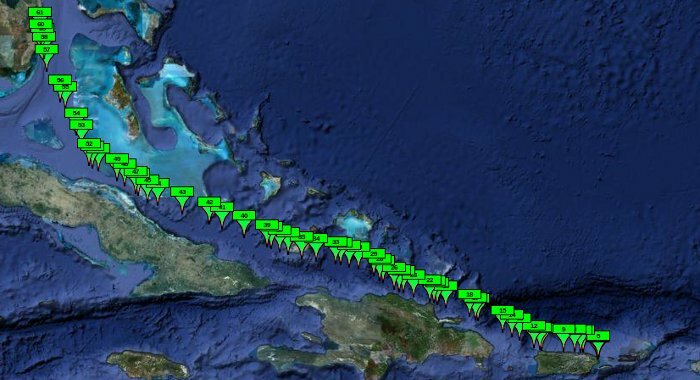 The first part of the journey from Puerto Rico to Lauderdale is in the Lee of Puerto Rico herself. San Juan is a must see destination if you have a chance and seeing the old Fort by sea is a wonderful sight. You should have a nice breeze and smooth seas. As you scoot out north of the Mona Passage between Hispanola and P.R., the seas will increase until you find yourself in the lee of Hispanola. The Dominican Republic is an amazingly beautiful landscape, lush and mountainous. The best stop for fuel is the newish Waterworld marina about half way along the north coast of the D.R. You can fuel up for the remaining three-fourths of the journey back stateside. The Dominican coast ends, and Haiti begins also incredibly beautiful on this Northwest point. Oddly a steady stream of disposable food containers and plastic bottles emanate from the Haitian shore. One can speculate this pollution as a result of the continuing post-earthquake turmoil in Port-of-Prince. Next you pass over the Windward Passage and under the first sighting of an island of the Bahamas, Inagua. Cuba, possibly blacked out on your charts, will be south. If you are not American, Cuba is another opportunity for stopping. I highly recommend avoiding Matthewstown, Great Inagua. Soon you will be heading more northerly towards the Florida Keys and up through the deep water Bahama Channel. At some point the Gulfstream will kick in, and you get a nice boost up the coast and back into 3G range to check back into the civilized world. If you are thinking of making this passage or have before and want to share your experiences, please post a comment below, and I will get back to as soon as I can check in to a wifi signal ashore.